Thank you very much for being a part of this wonderful community of bloggers. Someone emailed me this poem a few years ago and I have been keeping it, to read again and again to remind myself of the simple yet important things that I need to do now and then so as to lead my life with no regrets. I wish to share it with all of you who come to visit my blog. The words are copied from the poem while the pictures are from my own personal collection. Ma is squatting in the centre, front row. 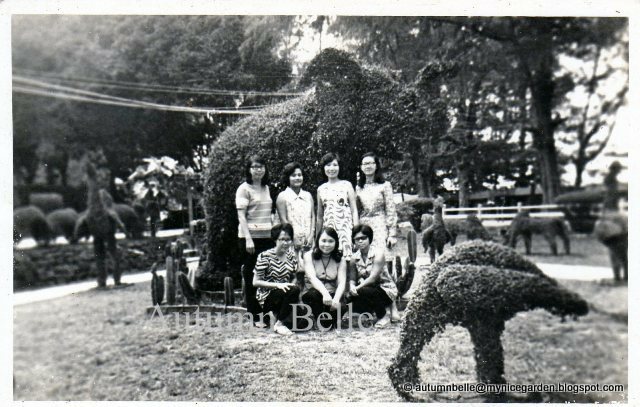 Teachers at a topiary garden in Kota Baru, Kelantan 1971. Everyday, we awaken with another chance at Life. and we often forget to appreciate the little things around us that mean so much. 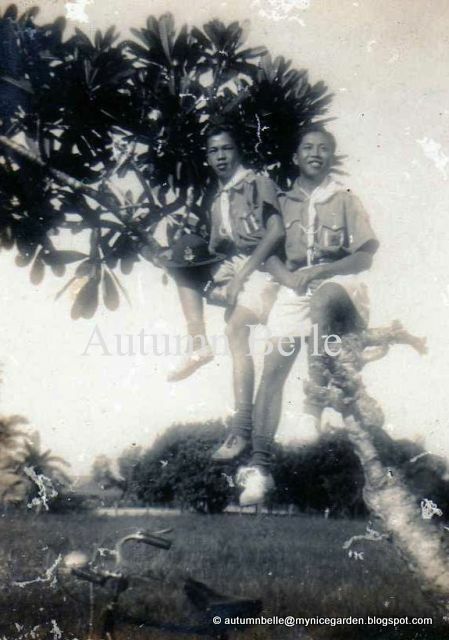 Pa is the boy scout on the left, atop a frangipani (plumeria) tree on a hiking trip. Hair groomed, greased and combed Elvis Presley's 1950's style. Too often we wait too late to say "I'm sorry - I was wrong." 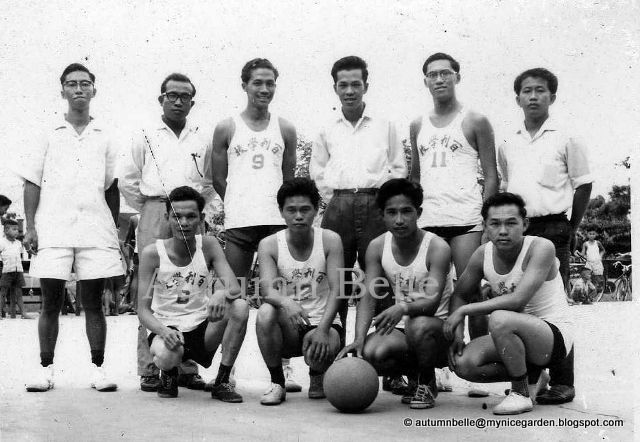 Pa is standing, 3rd from right. All of them are teachers. 1960's retro hair style? Ma is standing at the right corner. 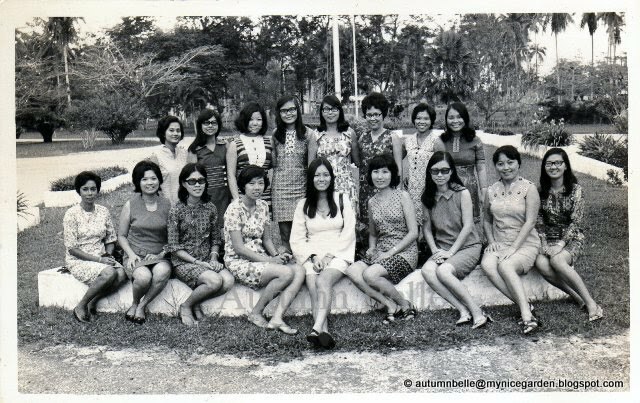 All pretty lady teachers 1971, hippies, miniskirts and a-go-go era. Ma is on the right. Yes! She loves taking photos at gardens too. The Ester Williams 1950s permed hairstyle and vintage dresses of the Rock n Roll, and days of jive? And be thankful for the little things in life that mean a lot. Somebody emailed this poem to me 2 years before mom passed on, followed by dad 3 years later. It really made me realise how important it is to appreciate the present, and to express my feelings more openly to my loved ones before it is too late. I am glad I learnt to hug them and tell them that I love them. I also asked for their forgiveness. Now, I have no regrets. Hugging and saying "I love you" was not something we Asians of the older generation can express freely and openly among children and parents. Luckily times have changed, now it has become more common and acceptable. I hope you agree with me that this touching short poem carry a very meaningful message on every line. It is like a summary of all the many many pages of self-improvement books we have read and motivational seminars we have attended. Once in a while, I read it to remind myself not to let anger blind me, be patient, count to ten, avoid saying hurtful things to people I love, for words are like water, once thrown out cannot be retrieved back. The damage is done when hurt is inflicted. Similarly, whenever I am delighted, happy or touched by a simple gesture, I used to keep to myself. Now, I try to express to the person who brought me this joy, eventhough this is the first time we meet or we never meet, except in cyber space. Therefore, if you don't know me, you may think that my expressions and comments are fake but please be assured that it is indeed genuine and sincere. Time and tide waits for no one. Procrastination is the source of many regrets. Happiness when shared is doubled and it multiplies. A happy ending this year brings forth a fresh postive begining for the next. So, here I thank you very much for your words of encouragement, comments and New Year greetings. It is already a blessing that we have met and communicated when we crossed paths in live's journey. May we now advance to 2010 with our hearts filled with joy and happiness. I am looking forward to start 2010 on a positive note. May you have a wonderful year ahead too! This post is dedicated to Ms Lona from Ohio, USA of A Hocking Hills Garden. I just love the snow, beautiful scenery and bird pictures she features in her 2 lovely blogs. Actually Roses, Recollections and Real Blogger Tips - the 3Rs ! 1. With hardly a week left before we bid farewell to 2009, this is my last Blooming Friday post for this year. As you look at the roses here, select your favourite. Some are imperfect, some average and there are the gorgeous ones too, just like us, human beings living in this imperfect world. I wish to thank each of my Followers, Commenters and Blotanists who has brought so much sunshine to my life, nurtured my first 0.5 years of blogging history and left me with so many memories to treasure for the years to come. By the way, you can see me in the shadows in some of the pictures below. 2. To my Followers and Commenters, please check your avatar or icons. Some of you do not have a link where I can find you to visit your blog and communicate with you. Do update your profile so others besides me can find you too. This is important. 3. Remember to back up your blog and template. This is very important! Can you imagine all your efforts and your beloved garden/blog disappear into thin air without a trace? Would you want to start from scrath all over again? Can you recollect everything you have ever written ? Backing up your blog enable you to rebuild your blog later. This includes all the comments too. Backing up your template enable you to rebuild your blog design. Diana of Voice In The Garden taught me this. For steps on how to backup your blog, visit our blotanist Jacqueline of Jacq's Blogger Tips. Her step-by-step instructions are easy to follow. You can learn how to sign with your own signature on every post and type the © copyright symbol. 4. Create another test blog to practice new formats, designs, widgets, HTML codes that you are unfamiliar with before making major changes to your blog. Believe me, it really helps. Sometimes, if you do many steps quickly or simultaneously, unexpected things happens. For example, Blogger may think that you are spamming and quarantine your blog for a week. Or you accidently press the delete key and important details are deleted. Joanne of Joanne's Cottage Garden taught me this. She saved my blog life when I had my first close encounter being listed by Blogger as a spam blogger. Scary huh? That's why we need guinea pigs for our experiments. Sometimes, Blotanists need to behave like scientists too. 5. Photographs are important in blogging. Afterall, a picture speaks a thousand words. Resize your photos to 640 x 480 pixels (36.4 kb) before posting to save storage space if you do not wish to pay more for the extra storage. Upload photos of big dimensions like 3968 x 2976 pixels (5.97MB) only when necessary. The difference is quite significant. 6. Download Picasa 3. I have learnt this from Tatyana, of My Secret Garden. It is free and you can use this program to create collages, slide shows, edit photos, insert water marks, file your photos and many other stuff that I am still experimenting. By the way, I haven't tried Photoshop yet, partly because I don't find a need for that at the moment. 7. If you are using Blogger, the new editor enable us to post X-Large photographs. But remember to add a few line spacing before you upload the next photo, otherwise you cannot insert any text later. Another way is to use the new editor to post photos, then revert to old editor for texting. Yet another way is to edit in Html mode which is a little bit tricky and you need to be more cautious. Update from commens: Diana of Elephant's Eye has a brilliant idea when using Bloggers new editor. She key in the texts before inserting the pictures. 8. Finally, this porcelain white rose is for my blogger friend Ms Andrea from the Philippines of Andrea in This Lifetime. This post is dedicated to her, the first commenter of my previous post, "Wednesday Wishes - Merry Christmas 2009". This bright spirited lady's latest post is "Hedges Delights" and the flowers are blooming beautifully. This is my entry for Blooming Friday, final week of 2009. The theme this week is "Christmas!" My grateful thanks to Katarina at Roses and Stuff for hosting Blooming Friday. To see what others have posted or to participate, click here. Acknowlegement: The photos are taken at The Secret Garden of 1-Utama. My grateful thanks to Dr. Francis Ng. Wednesday Wishes - Merry Christmas 2009! MAY THE LORD BE WITH YOU AND BLESS YOU ALWAYS! The theme here is Royale Christmas @ Pavillion KL. As I walked through the entrance to this mall, this is what greeted me. A magnicifient ballroom with red carpets from the entrance to the hall. Wouldn't Cinderella, Snow White and Belle be enchanted by all the splendour here? I can imagine how glamorous they will look, dressed in their beautiful gowns, led by their hansome Prince Charmings. As music and laughter filled the air, would they want to dance to a waltz? The Pavillion KL is a "1.37 mil sq ft retail haven with 430 outlets offering the finest fashion and home furnishing to entertainment and culinary delights. It also houses flagship boutiques from the world over". Here, you won't run out of ideas for Christmas shopping. Standing up here on the upper floors and looking down at the vast space filled with people and shops make me dizzy! While Santa was busy distributing presents and fulfilling wishes to shoppers, his sleigh was parked at the entrance. At designated times, pretty elves pose for photographs. The reindeers seem to be flying to reach for the stars. Now, which one is Rudolf the Red Nose Reindeer? 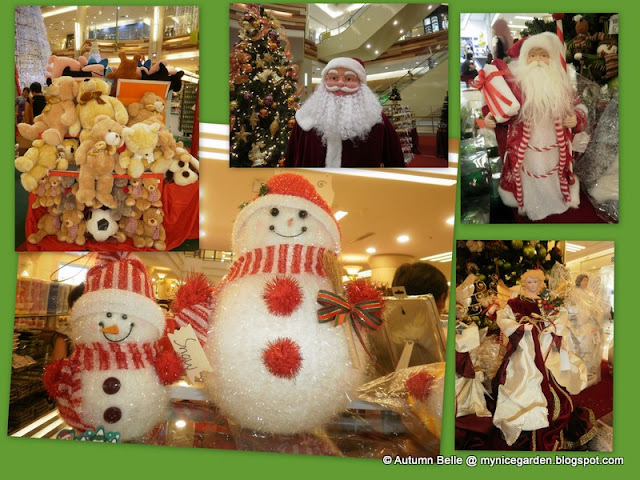 At the 1-Utama Shopping Center, Petaling Jaya (the place of The Secret Garden), they are having a White Christmas. At the Curve, another shopping complex in Petaling Jaya, its White Winter Wonderland. Look, it is snowing in Malaysia! Everyone was waiting patiently. When it really started to 'snow' , everyone wanted to experience snow falling on themsleves. Cameras went click, click, click. Say cheese, say kimchee, just give me a lovely smile in your own language. I have something that I have been keeping to myself for a long long time. Now I wish to tell you. When I was little, there was this song that mum used to play in her record player, "I saw mummy kissing Santa Claus last night". I really couldn't understand nor accept why the mum in the song was kissing Santa and not dad! After all, Santa's job was to give presents to make kids happy. Finally, it came to light that Santa and dad may be the same person after all. So, finally that song had a happy ending for me. Chapter closed. My post today is dedicated to Carol Duke of Flower Hill Farm, my first commenter for my previous post Rose, Rose I Love You. Carol is from Massachusettes, USA and her blog is filled with many beautiful pictures. I especially love the splendid sceneries and her lates post is on winter solstice. That’s newly sprung in June" by Robert Burns. (Thank you for this beautiful quote, Babara of Gardening in Mannheim, Germany). Today December 22nd, 2009 is mid-winter solstice. It is a day when I celebrate the Dong Zhi Festival by offering prayers and making glutinous rice balls or Tang Yuan. The whole family will gather together to eat tang yuan. When I was little, grandma used to tell me that this was an important day, more important than Chinese New Year, for after this day, I shall get older by one year. 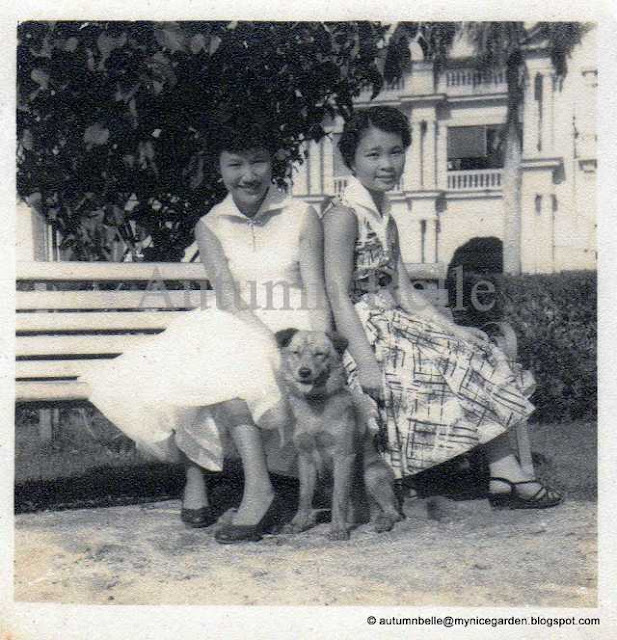 She had many fond memories of celebrating Dong Zhi with her family members in Fusan, China. 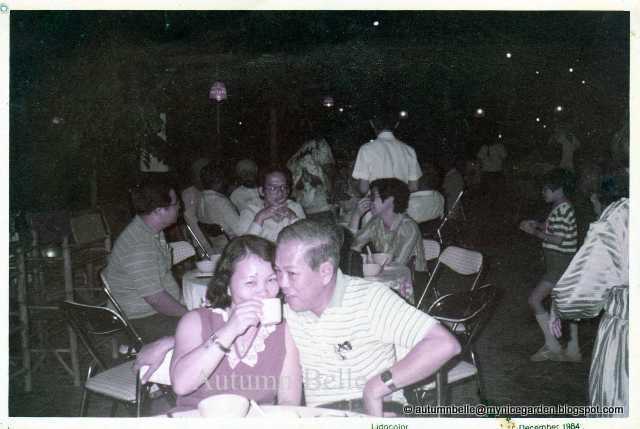 Grandpa will tell his story about Kwantung (Canton) and Mum would tell hers about Swatow, Teochew style. An uncle from Hong Kong and another aunt in Thailand will celebrate theirs a little bit differently. I used to wonder how long more will this festival continue to be celebrated. Eventhough we are living in the sunny tropics where there are no winters but endless summers, many of us still hold on to this tradition. When I was younger, it was quite difficult for me to relate to the special significance of this festival. Now that I have virtually travelled round the world watching the seasons change in your gardens and homes, I begin to appreciate what it means even more. I guess Dong Zhi will continue to be celebrated for as long as there are winters and the 4 seasons on Earth. The Dong Zhi (Chinese: 冬至) or Winter Solstice Festival (Extreme of Winter) is an important festival celebrated by Chinese all over the world. This day which usually falls between December 21 - 23 is a day signifying the "Extreme of Winter" when sunshine is at its weakest and daylight shortest in the Northern Hemisphere.The Chinese believe that although the yin qualities of darkness and cold are at their most powerful at the time of Dong Zhi, it is also a turning point, heralding the dawning of the light and warmth of yang. In olden days of China, winter was a cold and because medical science was not so advanced then, many people froze to death. On this day, offices and businesses would be closed. Family members return home and gather together to eat tang yuan. Dong Zhi is thanksgiving, Chinese style. It is the last festival of the year. Coinciding with the winter solstice, it is a time for the entire family to get together to celebrate the past good year. Glutinous rice balls known as Tang Yuan (汤圆) are cooked and eaten to signify unity and harmony within the family. Tang Yuan of various colours in sweet syrup (brown sugar or 'gula Melaka' on the left). I like the syrup with pandan and ginger flavour. We make the pink/red ones to bring good luck. The green ones are usually pandan flavoured while purple ones have yam. Orange looks like gold. This is also classified as 'tong shui' or sweet dessert drinks. In Malaysia it is available throughout the year. Are you celebrating the Winter Solstice too? This post is dedicated to Deb of Dragonfly Treasure blog from Newman, California, USA my first commenter for my previous post, The Secret Garden of 1-Utama. She has a beautiful mozaic of snowman pictures in her latest post. Acknowledgement: The pictures are taken at The Secret Garden of 1-Utama. The Secret Garden of 1-Utama is located at the rooftop of a 7-storeys building at the 1-Utama Shopping Complex in Petaling Jaya, Selangor, Malaysia. I have already published 18 posts about flowers and plants from this garden and yet to my surprise, I found that I have not written about this garden before. Well, today I shall take you on a journey of discovery to this eco-friendly garden. 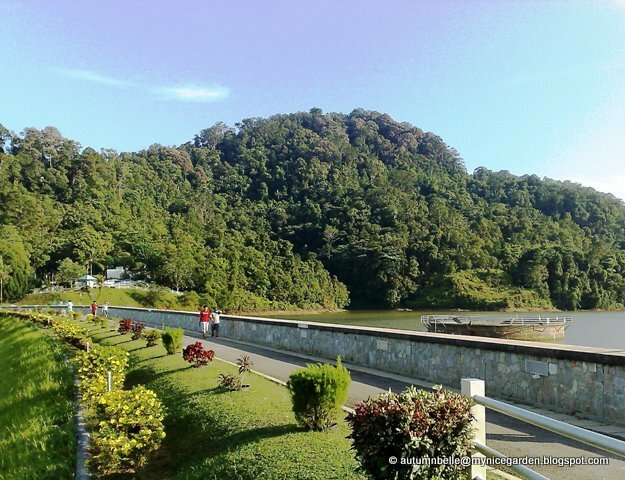 "The Secret Garden of 1-Utama", a copyrighted post, was written for My Nice Garden blog by Autumn Belle @ http://www.mynicegarden.com/ on 18th December, 2009. This post is dedicated to my learned new friend, Ms Andrea of Andrea in this Lifetime, from The Philippines, the first commenter of my previous post, Etlingera elatior "White Torch Ginger Flower". We are from almost similar climate zones and therefore we share many plants in common. I am glad we found each other through blogging and together we share many happy moments visiting virtual gardens around the world. Botanical name: Etlingera elatior "white torch"
The picture shows an unopened bud and a fully opened flower. The bracts are white and looks like "petals". The true flowers are actually the tiny yellow ones emerging from the bracts. You can see this from the close-up photo in the first picture. Just look at the gracefully arching tall leaves that may reach 10 - 15 ft tall. Flowers stalks start from the ground and may reach 3 - 4 ft in height. The easiest to grow is by divisions of the rhizomes but it can also be propagated by seeds. This plant loves the sunny weather and lots of water. The preferred soil medium is sandy soil which must always be kept moist and not to let to dry between waterings. The plant may take more than a year to start the flowering process, but once started, more blooms will appear quite continuously. This plant needs quite a lot of garden space (about 5 - 6 ft wide) and is best grown on the ground instead of containers. This post is dedicated to the first commenter of my previous post, my blotanist friend from Central Alberta, Canada, Ms Tootsie of Tootsie Time. She is responsible for the fun and interesting Fertilizer Friday meme that I participate every week. Her latest post is about making your own ornaments for Christmas and she is indeed very talented & full of creative ideas. My special thanks and the efforts of growing this wonderful plant goes to Dr. Francis Ng, consultant botanist at The Secret Garden of 1-Utama, the source of my photos. Dr. Francis Ng's writes his own blog at Tropical Gardening. To check out other Macro Monday posts, please click here. HELP! There are UFOs in The Garden! I found this violet/lavender flower at The Secret Garden of 1-Utama. There was no tag on it. This is definitely not a morning glory because it is not a vine. It grows in a pot and has a lot of flowers. Perhaps the leaves may serve as a clue. Is this a species of the Browallia or Amethyst Flower or Sapphire Flower? Can someone please help me identify this beauty? Update: My grateful thanks to Dr. Francis Ng for identifying this flower as Ruellia humilis aka blue shade aka wild petunia, native to Texas, USA. My special thanks also to Stephanie of Steph's Green Space for providing the initial lead. 2. The 2nd is an Unidentified Flying Object. This tiny butterfly is resting on an Aztec arrowhead (Saggitaria montevidensis) flower. This poor thing seems to be injured as its wings are torn. I'm sure the little ant didn't do it. But then again, why not? Maybe it was Atom Ant who was undergoing some transgressions and became a villain. Is this a gram blue or pea blue butterfly? Update: My grateful thanks to Kanak of Terra Farmer for helping me identify the butterfly as cycad blue/chilades pandava. 3. This 3rd Unidentified Flying Object is a bird. Can this be the yellow bird ? I mean the same yellow bird that I have always dreamt of seeing from the "Yellow Bird on a Banana Tree" song. By the way, this is not a banana tree but a palm tree. Note: All the photos are taken at The Secret Garden of 1-Utama. Update: My grateful thanks to Dr. Rezlan (aka Tabib) of Birds and Nature Photography Blog for helping me identify the bird as a male olive-backed sunbird. This post is dedicated to Ms Noelle Johnson (Azplantlady) of Plant Tips and Guidelines for the Desert Garden from Phoenix, Arizona, USA. She was my first commenter for my previous post. I am very glad to know her through Blotanical. Through her blog, this qualified garden consultant has shown me how beautiful desert gardens can be. She eliminated many of my myths about greens in deserts and she gives great gardening tips. This is my entry for Blooming Friday, 2nd Week of December. The theme this week is Remembering a Particular Event'. As I am having UFOs here, so I'll think of Star Wars, starring Yoda (flower) Han Solo (ant), Princess Leia (butterfly) and spaceship (bird). My grateful thanks to Katarina at Roses and Stuff for hosting Blooming Friday. To see what others have posted or to participate, click here. This is also my entry for Today's Flowers #70. My grateful thanks to the TF folks: Santilli, Denise, Pupo and Valkyrien for hosting Today's Flowers. To participate or view other floral displays around the world, click here. This post is dedicated to my blotanist friend, LeSan from Blue Gate Gardens, my first commenter for my previous post. I so am captivated by the creative way she writes her posts, I suspect that she is a Hollywood screenwriter. I'll be hopping over to her blog for some nice chrismassy atmosphere. My post today is dedicated to Nell Jean of Secrets of a Seed Scaterrer, my first commenter of my previous post, Mussaenda philippica 'Queen Sirikit'. Reading her posts always put a smile in my face. She is a great writer, photographer and presenter. She also has a great sense of humour. Christmas came early for me. I am looking forward to enjoy the spirit of the season with my blotanical friends around the world. Hey, I have received some presents already! I have just been given an Honest Scrap award by James Missier of Garden Chronicles when more presents arrived. These are prized possessions given by my blogger friends from Blotanical which I will treasure and display at my sidebar. 1. On 22 Nov 09, My Nice Garden (MNG) has received a second Honest Scrap Award from Babara_elaine of Gardening in Mannheim, Germany. Her post is titled, "Proud to be an Honest Scrap. " 2. On 23 Nov 09, MNG received a Best Blog Award from LeSan of Blue Gate Gardens. Her post is titled, "The Red Carpet Needs Shampooing". 3. On 27 Nov 09, MNG received a Best Blog Award from Wendy of Greenish Thumb. Her post is titled, "....... why someone would consider this blog "best". Duty 1: Brag about the award. Duty 4: Pass on the award to 10 fellow bloggers you admire. Duty 1 & 2 - already done. 1. I have never seen snow in my whole life. Rosey Pollen of Dung Hoe has taught me how to put virtual snow in my blog. 2. Neither have I even seen a real apple, peach, orange or cherry tree. 3. When I was little, I wished that someone will give me an autumn maple leaf of which I will keep in the story book I am reading as a bookmark. I thought all maple leafs came from Canada. That was until it saw real maple leaves in Korea. 4. I just learnt what is an advent wreath for Christmas from Babara_elaine and Diana of Elephant's Eye's recent posts. 5. I just learnt what is a christmas pickle ornament from reading Wendy of Greenish Thumb post today. Now I know its significance. Before that I didn't even know such a thing exists! 6. I still do not know/understand what is the 'allotment' that gardeners in the US talk about. 7. I felt funny when I received my first virtual hug from blotanists. I felt even more weird when I go overseas and get hugged by strangers. Hugging is not commonly done here, maybe because Malaysia is so hot and humid, so everyone is sweating (just joking). Now, I think virtual hugs are fun, friendly and nice. (8-10 is how I learnt a lot from bloggers who comment on my blog). 8. I recently saved MNG from disappearing by using a test blog to practise my HTML kungfu. Thanks to Joanne. You see, I did my stunts, rehersals and auditions using a test blog. When I took too many chances, with many changes, my test blog was quarantined by google as a spam blog for more than a week. 9. It is only recently after my first scare (no. 8) that I learnt how important it is to backup my blog regularly. This I learnt from Diana (Voice in the Garden). Diana commented on my post and taught me how to do it. Her most recent post today talks about the Best Blog Award. Do check out this factual and very interesting read. 10. I learnt how to backup my blog, template, sign artistically at the end of every post from Jacqueline. I even learnt the code for typing copyright symbol on my photos. Join me in tutorial class at Jacq's Blogger Tips. Jacqueline is a newbie blotanist at John & Jacq's Garden. She has detailed classification of many plants which I find very useful. I'm sure almost all of us have received such awards already which makes it meaningless to give out to them again. Moreover, why give headaches and what some call a double whammy? I spent a few days doing this post which took a lot of my time. Now, as we are nearing the end of the year, I'd like to take this opportunity to give my awards to everyone who has touched my life in one way or another. I wish that James Missier, Babara_elaine can accept the Best Blog award from me. Wendy and LeSan already has both, I think. 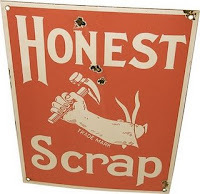 Otherwise, I'd like to give the Honest Scrap award to them. I wish to thank all my friends in the Followers List here at the sidebar, all who have faved me at blotanical and also those who came and took time to comment on my silly posts. Here is a list of my commenters, from my 5.5 months blogging history with 90 posts. I must confess that I have copied this idea shamelessly from my blotanist friend, Tatyana of My Secret Garden. This looks like a list of names for baby boys and girls! Hopefully, I didn't miss out anyone. Choose your toy. Santa Claus is coming to town! I wish to be thankful for all the little things in life that means a lot. I AM SORRY I WAS WRONG! A gazillion apologies.